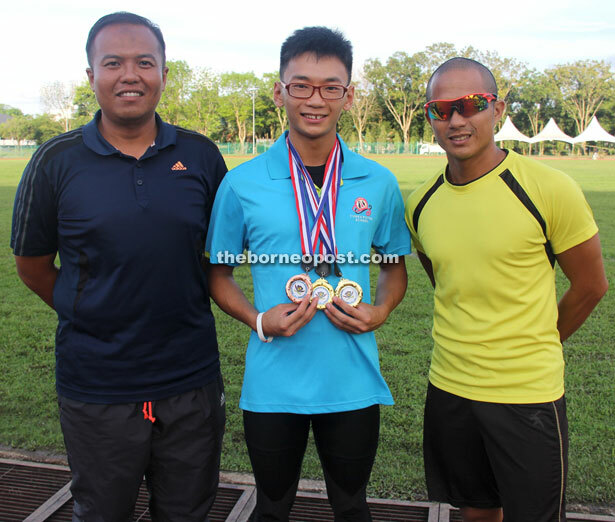 KUCHING: Promising sprinter Asly Chua An Wen is hoping to be given a chance to represent Sarawak in Sukma 2016 after breaking the Boys U18 100m record at the recent 51st MSSM Kuching (Zone B) Track and Field Championship at Jubilee Ground. The 17-year old student of Tunku Putra International School clocked 10.85s to win the gold medal in the Boys U18 100m last week. His feat erased the old mark of 11.00s set by Terrance Manja Janting of SMK Penrissen No. 1 in 2012. Apart from winning the 100m gold, Asly also finished first in the Boys U18 200m (22.43s) and collected a bronze in the Boys U18 4x100m relay in the same championship. “I am very happy and proud of my achievement and all my hard work and efforts in training had paid off handsomely,” the younger brother of national tennis player Aslina Chua said when met at Jubilee Ground on Friday. According to Asly, he was surprised by the new record as his personal best in last year’s championship was 11.30s. Before the competition, he had trained every Monday to Saturday from 4pm to 6pm to improve his personal best. “The new time (10.85s) is still not good enough for me and I am confident of bettering it with consistent training,” said Asly who wished to follow the footsteps of local sprinter Nixson Kennedy who is currently undergoing training at Bukit Jalil in Kuala Lumpur. Asly thanked his coaches Azyzy Ahmad and Iskandar Goh who had helped him tremendously with his training. “Not forgetting my teammates, my school Principal Susan Holmes and parents who have always given me moral support,” he added.